Those looking for a breakout performance from the Colorado Rockies against a lowly San Francisco Giants squad will have to wait another day. Though the final was only 1-0, the Rockies once again looked hopeless at the plate. Whether it’s “pressing” or simply bad luck, the club has yet to find a groove. In the last 54 innings, those woes have failed to yield a single lead, a determining factor in an 0-5 homestand against the Los Angeles Dodgers and Atlanta Braves, followed by an opening loss to the Giants. Ahead are the takeaways from another reticent performance from the Rockies. It’s inarguable that Jon Gray started the year in unspectacular fashion. In his first two starts, he gave up eight earned runs in 12.2 innings. In his latest outing, Gray spun 6.2 frames, allowing one run and striking out six. The lone blemish on his night was a hanging slider to Kevin Pillar to lead off the seventh that resulted in a 414-foot home run. At the plate, the run support for the bounce-back outing was nonexistent. The lack of runs was nothing new for Gray as his offense only accounted for two total runs in his previous pair of starts. 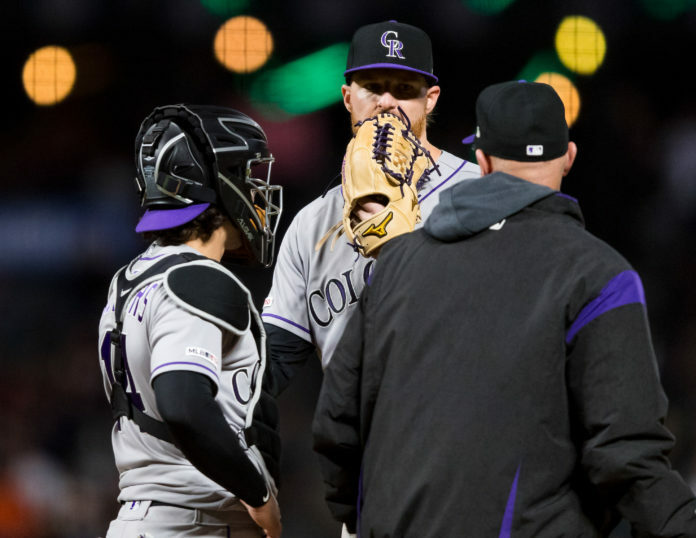 Much of what has plagued the Rockies has been a stagnant offense that has put unwarranted additional pressure on their rotation, a reliance that has caused small mistakes to sink several outings on the year. In regards to the back end of the rotation, wasting quality starts is something the Rockies can ill afford to do. Dismal early innings have done the team no favors. In 13 games, the Rockies’ opening frame remains scoreless. The only other team without a run in the first inning was their opposition Thursday night. To show for their efforts, the Rockies only have six hits, less than one per game in the inaugural stanza. In the second inning, that total remains at six, a zero in the scoring column as well. The slow starts have been a leading reason for the club’s woes thus far. Heading into their latest bout with the Giants, they hadn’t held a lead in the previous 45 consecutive innings. Outside of a half frame, that spree dated back to their second game of the year against the Miami Marlins. In that span, they won just one game, losing the other nine. Fast starts were often a catalyst to last year’s success. The Rockies first inning was their second-highest scoring frame last year (104) behind only the fifth (107). Reversing course and bettering their .140 batting average in the first inning will likely go a long way towards rebuilding an offensive rhythm. Relying on late-inning runs is a foolhardy plan if the club wishes to reach the postseason again. If there was ever a team for Nolan Arenado to slug his first home run of the year against, the Giants were a likely victim. Only Matt Kemp has tallied more long balls against the Giants in his career (26), with Arenado’s 24 serving as a close second. On a cool April night though, Oracle Park got the last laugh. In his six-plus year career, 2019’s 13 games extended the longest streak to begin a year for Arenado without a home run. A lack of power from their leader has subsequently sapped the team’s output. At only eight home runs in 2019, the Rockies remain tied for second-worst in the league. If you remove Trevor Story’s four, they’ve hit the least. Arenado has recorded 37-or-more home runs in each of the last four seasons, signaling patience is warranted. For the Rockies’ sake, they sure could use a breakout. In franchise history, the Rockies are 65-109 at the bayside ballpark that goes by many names. Long known for its watery winds from the ocean, Oracle has often served as a pitcher’s park. Last season, only Marlins Park allowed fewer home runs on average than the Giants’ home. The spree continued for the Rockies as they failed to register a single extra-base hit in the matchup, reaching second only once. Unless the club brings in a player with similar attributes to the former slugger Barry Bonds, those struggles will likely continue, similar to the Giants’ other opponents.